Comedy shorts, and on a different note, ethics in wildlife filmmaking. On a related but different note, I was unable to make it to events at the annual DC Environmental Film Festival which is co-sponsored by AU’s program as SCMS coincided with the events. Though I missed the events, Chris Palmer, the Director of AU’s environmental filmmaking program, shared the transcript of his talk on wildlife film. 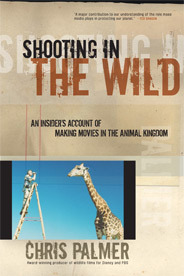 The talk continues his ideas outlined in Shooting in the Wild: An Insider’s Account of Making Films in the Animal Kingdom. Both the talk and the book are accessible to the non-academic and reiterate and add ideas to critical scholarly reflections of wildlife films. I’ve used the book in my undergraduate environmental film class and found the discussions it generates regarding ethical practices in filmmaking fruitful and productive as students both dissent and agree with Palmer’s evaluations of particular films as ethical or not even as they have that “oh no, really? that’s how they make some of these films?” moment.